I often write about our gluten free food finds since two of my children are on a GFCF diet (one for Celiac, one for ASD). Recently, a box arrived on my door step containing some new breakfast and snack options to try out. This morning, my little munchkins enjoyed Nature Path’s Organic Whole O’s and were THRILLED. In the past, I’ve brought home other O type gluten free cereals which couldn’t pass the kids taste test. So, I was thrilled when this tasty option arrived. The O’s are crunchy and the texture closely resembles the original O cereal we all know and love. The ingredients include: organic brown rice flour, organic corn flour, organic evaporated cane juice, organic pomegranate juice concentrate, sea salt. 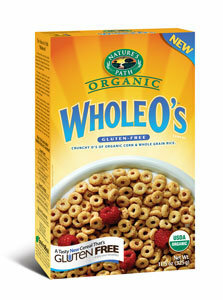 Whole O’s is certified USDA Organic, Vegetarian, Low Sodium, Trans Fat Free and Gluten Free. A 2/3 cup serving boasts 110 calories and 1.5 grams of fat. Our kids enjoy Whole O’s with a light drizzle of Agave and sliced bananas or berries. The EnviroKidz/Nature’s Path story has already been told on Eco Child’s Play, but we are always thrilled to try new products and flavors. Nature’s Path is a company devoted to producing high quality, organic foods in a sustainable method. Nature’s Path offers a variety of healthy, nutritious, organic foods, and the company has been committed to sustainability since the beginning, Nature’s Path also has a sustainability and stewardship manager to monitor sustainability issues and goals within the company. Nature’s Path works to minimize the materials and waste involved in its manufacturing, shipping, packaging, and throughout the workplace. Many cereals products are offered in EcoPacs and EnviroBoxes, which minimize the amount of paperboard, water, electricity and transportation used in the production process, and all paperboard from cereal boxes is made from 100% recycled paperboard. Check out the many breakfast options Nature’s Path offers, our non-gluten free kids love the Organic Toaster Pastries (we buy them in a 36 count box at our local Costco) as an occasional snack. « Cervical Cancer Vaccines: Risky Business? If you are looking for really tasty food that kids love, go to http://www.gfMeals.com, for a huge array of delicious GFCF entrees, sides and baked goods. I have a grandson with ADHD who has been thriving on this food and is no longer taking any drugs. When he accidentally goes off the diet he says his mind gets “foggy.” On the diet his mind is clear and he does great in school. By the way, gfMeals.com ships nationwide to your door. Have you tried Oatios? Those pass the taste test for me and my daughter.